CPAP and Anti-Snoring Devices - Which Treatment is Right for You? Sleep apnea is a disturbing breathing difficulty that can upset both you and your loving partner. This annoying malady, unfortunately, cannot ease on its own. The humorous snores that result from sleep apnea are symptomatic of more serious health conditions. Those who suffer from it may have obesity-related health problems such as heart disease or high blood pressure. People with sleep apnea often complain of gastroesophageal reflux disease (GERD) and asthma, though researchers have yet to prove that the condition has links with these diseases. As such, snoring issues need quick, if not immediate, attention. Those who snore turn to Continuous Positive Airway Pressure (CPAP) or an anti-snoring device to curb these irritating breathing pauses. All snoring treatments have benefits and drawbacks. You will have to consider both before deciding which treatment is right for you. Before you can decide on a snoring treatment, you must know what causes this condition. Knowing what causes your snoring will help you decide whether to undergo CPAP (Continuous Positive Airway Pressure) therapy or use an anti-snoring device. Snoring happens when air passes over a blocked air passage. The air causes the muscles in these passages to vibrate. Loud wheezing snores result. You may have bulky tissue or weak muscles in your throat. Weak muscles collapse and block the throat, an important airway. This triggers snoring noises. An elongated tongue or soft palate may fall back and block the airway as well. You may snore if your jaw is not well-aligned. It may obstruct your throat passage. Alternatively, you may have a nasal valve that collapses under pressure, blocking your nasal passage. Occasional colds and respiratory problems may cause mucus to form and block air passages. This may bring about mild snores. Snoring occurs because of blocked airways. Many sleep apnea sufferers rely on Positive Airway Pressure treatment to prevent airway obstruction. Doctors apply this pressure to stent the alveolus (lung cavity) and keep it open. CPAP is a form of this pressure. As its name implies, a ventilator applies pressure continuously to keep air passages open throughout the night. Doctors recommend this treatment to patients who have asthma, sleep apnea and other serious breathing difficulties. A CPAP machine comes with a mask that covers your mouth and nose. Specially designed CPAP machines are available for use at home. Among them Nasal CPAP (NCPAP) machines, which apply continuous positive airway pressure through the nasal passages. Users must wear a nose mask. These machines also come with prongs that keep nasal passages open. They apply constant pressure on your airway, through masks, while you sleep. Applying pressure on the airway stops it from falling back. 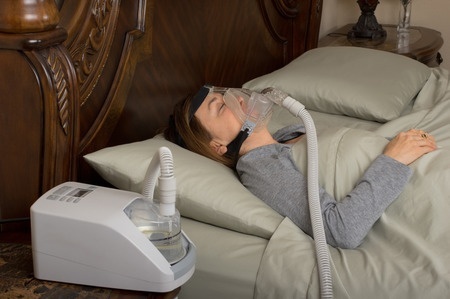 CPAP treats sleep apnea effectively. That said, it has flaws like every other form of therapy. Studies prove that CPAP keeps a sufferer awake during the day. One study by Ballester E et al divided sufferers into two groups. One group received only conservative treatments such as weight loss and medication. The other group received these treatments with CPAP. The group that received conservative treatments with CPAP reported a great improvement in their alertness during the day compared with the group that received only conservative treatments. Patients who went through CPAP treatments also reported an improvement in mood. They observed a lowering of anxiety levels, better concentration and increased productivity. Research points to a correlation between CPAP and blood pressure. A study by Miguel-Angel Martínez-García, MD et al again divided participants into two groups. Both groups received medication to control their blood pressure. While the control group received only the medication, the test group received medication and CPAP. The group that received CPAP reported a drop in blood pressure levels. c. Decreases the risk of heart failure. One of the drawbacks of CPAP therapy is that it is difficult to find a mask that fits your needs. That said, you can have your mask customized. Your provider can construct one based on your facial shape and size. To add, masks come in many styles. Full feature face masks have rubber bands that stretch across your face. They may make you feel claustrophobic, but are suitable to wear if you move about in your sleep. Other CPAP masks feature nasal pillows and are more comfortable. The nasal pillows fit under your nose. These mask have straps, but they cover less of your face than full-feature masks. They work well for those who wear glasses, but less so for those who move about in their sleep. CPAP masks come in different sizes as well. Seek your doctor’s advice about customizing one to suit your needs. It also takes time to get used to a CPAP device. Most users find the mask cumbersome and difficult to get used to at first. Try wearing the mask for short periods during the day. Then, get used to wearing it with the hose and air pressure on. Once this has become second nature to you, wear it while you sleep. Consistency is important when using your CPAP device. Wear it for one day and forgetting to do so the next may make it more difficult to get used to. Then, you will have to get used to having your breathing regulated. Some CPAP users find this hard to tolerate. To do so, learn how to adjust the ramp on your machine. The ramp feature allows you to increase and decrease its pressure. You can begin with low pressure and gradually increase it until you are comfortable. A CPAP machine’s heated humidifier deals with dry noses. You can adjust its humidity level. If heated humidity fails to work, the doctor may recommend a nasal saline spray. A CPAP mask encloses your face, so you may feel some claustrophobia. To counter this, put the mask on in stages. Begin by holding it up to your face. Once you become used to this, wear it with straps. Turn on the pressure while you are awake. Then, start wearing it while you sleep. The CPAP procedure, which is relatively inhibiting, may not suit every sleep apnea sufferer. Many rely on anti-snoring devices to stop their snoring woes. Oral devices, as their moniker implies, refer to devices that you place in your mouth while you sleep. These fall into two categories. Mandibular Advancement Devices (MADs) work by pushing the jaw forward slightly so that it no longer blocks the airway. These devices usually take the form of splints that users insert into their mouths to hold the jaw in place. An elongated tongue may fall back and block your airway while you sleep. A Tongue Stabilizing device, as its name suggests, holds your tongue in place and prevents it from collapsing over your airway. It is usually made of plastic. Chin straps, worn across the chin and over the ears, support the jaw while you sleep. This prevents airway obstruction caused by a wrongly aligned jaw. A nasal strip is a bandage that a user places over the bridge and sides of his nose. It prevents the nasal valve, which is often subject to pressure, from collapsing and blocking your nasal passage. It conforms to the skin and holds the nasal aperture open. Each of these anti-snoring devices, like any other, has its boons and flaws. You need to weigh their advantages and disadvantages before using them. MADs and TSDs have their draws. These oral devices are often more comfortable than CPAP masks. You cannot discount comfort if you want to sleep well throughout the night. To add, most are relatively user-friendly. Users need only place them correctly to get a good night’s sleep. Most of them work effectively. Though none of them can guarantee a complete solution for snoring, they work well for most sufferers. These devices, however, come with problems. Many people complain that their jaws hurt after using mandibular advancement devices. Other users develop problems biting and chewing their food after trying them. Chin straps are more comfortable than oral anti-snoring devices. Manufacturers make them from neoprene, a comfortable material. Chin straps are far from perfect. They tend to slip off during sleep. Many cause an itching sensation. Placed across the nose, nasal strips are relatively comfortable to wear. The work well to keep nasal passages from becoming flaccid. However, they only work well if your snores arise because your nasal valve keeps collapsing. An anti-snoring or CPAP device: Which is better for you? With the draws and flaws of these devices in mind, it is time to choose a suitable one for yourself. Watch this tips video from the FDA on CPAP devices. You will find CPAP effective if you have moderate or severe snoring problems. The mask that you will need to wear when using the machine, however, is uncomfortable. It may disrupt sleep, a great drawback if you do so lightly. Finding a fitting mask is also difficult. Mandibular Advancement Devices curb sleep apnea. They work well for those with oddly lined jaws, but not for those who do not like to have objects inserted into their mouths. To add, these devices may cause you to feel pain in your jaw. Tongue Stabilizing Devices are useful for those with elongated tongues or soft palates, which may collapse and block air passages. Having this device in your mouth nightly, however, may prove uncomfortable. Nasal strips work for those with fleshy noses. A fleshy nose may put the nasal valve under pressure and cause it to collapse. They do not work as well if you owe your snoring problems to a misaligned jaw, obesity or weak throat muscles. Both CPAP and anti-snoring devices work well, depending on what causes your snoring and how severe it is. Should you decide either yourself or with your doctor that an anti-snoring device is right for you, feel free to read our review on the best rated device for 2015. Hopefully this will help give you an informed decision on you device purchase.